Volkswagen has been slogging through the trenches of the Great Hot Hatch war for 43 years. The Golf/Rabbit GTI has been on the front lines since the beginning, and has fended off competition from France and Japan quite well. 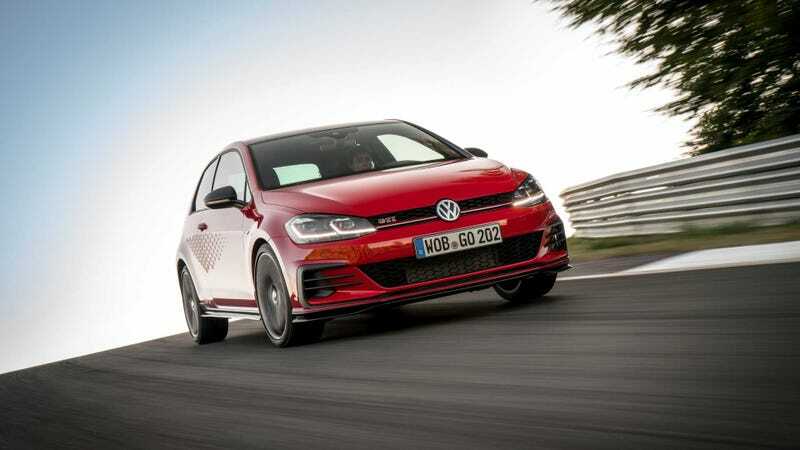 In the newest extra-performance version of the GTI—Which Volkswagen unveiled in near-production “concept” form last year—it channels its TCR race car to create a 286 horsepower version of the turbocharged 2-liter hatch. And if you live in the U.S. market, you can’t have one. That boost in power comes with an optional 5 mph boost in top speed to 161 mph, and a 0-60 sprint of just 5.6 seconds. The GTI TCR also comes with a bunch of standard equipment, including a locking differential, cross-drilled brake rotors, and LED headlights to name a few. The GTI TCR will only be available in 3-door body style, and with a 7-speed DSG transmission. All of this performance comes with a massive $44,295 price tag. This TCR model comes with a variety of 18" wheels standard, though 19s can be ordered with an upgrade package. Visually, the TCR will be differentiated with a few decals bearing the name, black exterior mirror caps, rocker covers, a front splitter, a new roof spoiler, and a rear diffuser. The car will also project “TCR” onto the pavement below when you open the driver’s door. You can opt for a honeycomb pattern decal set for each side of the car, carbon door mirror caps, and a black painted roof. The aforementioned upgrade pack includes 19" wheels with wider performance tires (or motorsport-ready semi-slick tires), a 5 mph boost in top speed, upgraded rear dampers, and Volkswagen’s DCC adaptive chassis control system. The standard package will run $2670, while the race tires pack adds $3640 to the price tag. Is there a world where a limited production performance version of Volkswagen’s hot hatch costs nearly $48,000? I guess so.